Elias Cairo, salumist and owner of Portland’s award-winning Olympia Provisions, does not only make salumi and own a restaurant and meat plant. You don’t just decide one day to become the kind of charcutier he is — the skill and mind-set are cultivated over a lifetime. Butchering whole animals and making sausage with his father, watching his mother preserve leftover meat by making rillettes and coming to understand the global definitions of pantry, larder, stores — provisions, as they were originally intended — has made Cairo a historian, artist and scientist as well as a provider. To hunt and preserve meat for the winter or other lean times is a practical survivalist act not often seen in this day and age. To hunt (or responsibly source) and preserve meat for the modern discerning palate, according to the meticulous craft honed all over Europe for many hundreds of years, is a favor to humanity. What’s a footlong kimchi dog without a little rice? This is a frank done right. The muffuletta dog, with pepper and olive relish, mortadella and provolone. But enough about the franks — there’s so much more to his craft than virtuosity with a tubesteak and bun. So much so that Cairo’s charcuterie is one of Oprah’s Favorite Things. I recently ushered Cairo and his magical wooden crate of various compressed, ground, dried, spiced and otherwise spectacularly preserved meat into Food Republic headquarters with the kind of drunken fervor I reserve for masterfully cured pig and those who champion it. Which element of the charcuterie board do you identify with most closely? I would have to say a pâté kind of sums up what a charcuterie board is. A simple pâté that’s done absolutely perfectly is my favorite. I’m a salami maker first and foremost, so that’s my favorite to have, but when I think of a delicious charcuterie board, I think of super-tender pâté. Any preference between the mousse and country types? A perfectly made country pâté is my favorite, where it’s not too cat food–y tender and still resembles meat in some form. Sometimes it’s so easy to make a pâté so light and not resemble meat at all that you have to remember it’s still meat. In the book, I really want people to make pâté. It’s such an easy thing. The first one I ever made was like garlicky cat food, and it was hard to make. Totally, and it is hard, but once you got the base down, and the right amount of panade [starch and liquid] and salt, it just becomes more fun. What is the very first charcuterie you ever made? I would have to think back to when I was a kid. We would make confit and rillettes out of everything. My mother actually used confit-ing to keep everything from going bad that we ever had in our entire refrigerator. If we ever had chicken that was going bad, or anything, she would just cover it in olive oil, slow-cook it and then chop it up for any which way. Making rillettes was impossibly fun. How do you source the spices that you use in your charcuterie? We are lucky to have Oregon Spice, which is a huge spice company right in Portland. A really amazing friend of mine who works there will usually bring us about seven corianders, then we pick and buy in bulk. That’s something that’s very unique to my product: We formulate recipes the night before, and when we come in the morning, we hand-pick, hand-chop and then run all of our spices through a coffee grinder, probably 10 minutes before they actually go into the product. Say you live in a 400-square-foot studio with a tiny kitchen. What’s something you could make as somebody with not a lot of space who doesn’t necessarily want to poison everybody with botched meats? Without a doubt, my favorite thing to teach people how to make is capicola. I can make that in the conditions described? It’s so simple, you’re going to laugh. 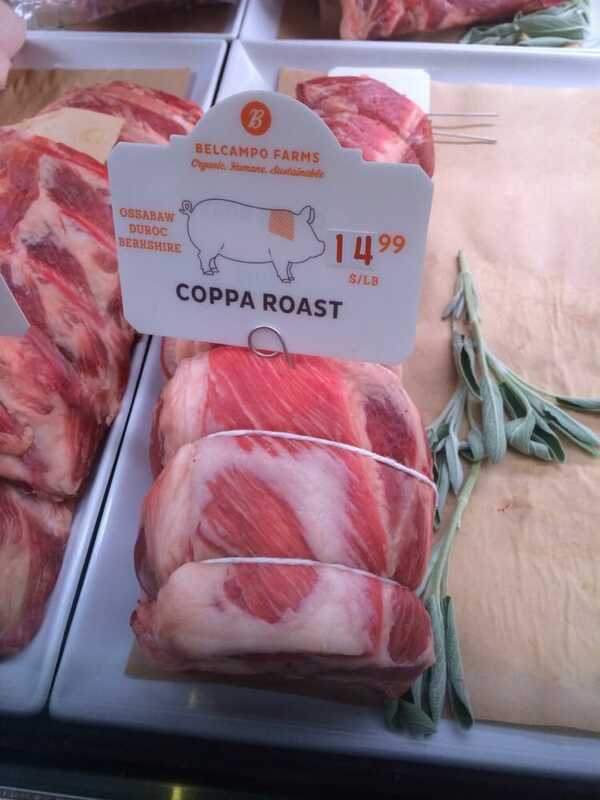 A capicola is the coppa of the shoulder — you can get any butcher to cut it. Just ask your butcher for a coppa roast, make the salt and cure recipe and put it in a plastic bag. On the fifth day, flip it, take it out, rinse it, coat it, steam it in your oven — so put a hot pan of water in there just like you’re cooking a roast, cool it off, and you’ll have capicola. If you can roast a roast, you can make a capicola. Bring along a picture of a coppa. It’s a bit of a newer cut, but the butcher will know it once he sees it. Speaking of easy, I was surprised to see coppa di testa in the first chapter of the book. It’s next to duck confit, which is very easy to make. Coppa di testa seems more challenging. That’s the one that I teach a lot of classes about, and I’m always like, “Who would actually do this?” It’s amazing how many people actually go home and then make it. Mine’s way easier than regular head cheese. Deboned, rolled, cooked and sliced — Cairo’s coppa di testa is the easiest head cheese you never had to pick apart by hand. Where did you learn to butcher? I grew up butchering with my father, and when I was 19, I moved to Switzerland. The owner of the hotel and restaurant I was working in was the jägermeister [hunting master] for the valley, so if you shot an animal in our valley, you had to bring it in to us to check it in. Absolutely. It’s amazing. Every animal is accounted for, and the jägermeister is their friend, really. He watches the migration of every animal and sees if there are any sick ones. Once you kill one, you definitely have to bring it in and make sure it was the animal you were supposed to shoot and that it was healthy. I think I butchered 280 elk. I started with wild animals, and it was heaven for me. It really, really makes you appreciate meat. Hitting that one elk and having it butchered is just so much work — heaving it up a steep hill, making sure it doesn’t go bad, preserving it and utilizing it and making sure you’re doing it all really well. Let’s talk about that meticulous attitude that you encounter in Switzerland that results in everything being prepared just so and arranged beautifully, and why it applies to the quality of your charcuterie. Every person that you meet in Switzerland works so hard, sunup to sundown, making things perfect, it sometimes just takes over your life. If you’re butchering and drop a piece of meat on the floor, you would pick it up instantly, throw it away and feel like an idiot for doing it. It’s everything: the way you keep your knives sharp, the way you start your morning, the way you pick up meat — everything is so thoughtful and precise. Everything about it is done on a different level than I’d ever seen. It just becomes obsessive. You cannot do it another way. The four butchers that are with me are the most perfectionist people in the world. If something goes wrong, you honestly see them get sick. Like “One of my salamis didn’t ferment” or “There’s a hole in my salami” or “We overcooked a rillette and it turned cottony”? You’ll see them react like, “Oh, my god, I’m going to die.” When we get a complaint, which is inevitable if you’re shipping molded meats that are actually fermented across America and you don’t want to use any additives or anything, I might hear “Eli, we ruined something. A box of salamis turned green because they got too much humidity on the way to Florida.” It’s so painful for them, sometimes I just don’t want to tell them when something gets screwed up. That is some deep empathy. The Swiss do not mess around with their perfection. One guy I worked with in Switzerland is truly a perfectionist human being. His house is 300 years old, and his great-great-grandfather made presses to make their charcuterie into squares. He makes all of his meats perfectly square because he feels that it helps everything dry completely naturally, and they fabricate everything in his house. That is the sign of a Swiss product — that it’s square. No meat maker in Spain or Italy makes square sausage, because why would you? But in Switzerland, if you square it and make it more perfect, it’ll dry more evenly. Exactly. Everything about it is amazing. There are many different colors of charcuterie, specifically when it comes to mold. What are some colors you never want to see? Tell me about “house flora,” the natural bacteria native to a specific fermenting area that makes it all happen. Cheesemakers use this term a lot, too. European house flora is taken very seriously, especially in Switzerland, where two cheesemakers will be right next to each other. When you’re developing it, all you can really do is try your hardest to coax it. There’s no way to harness it, you just have to steer it in the right direction. You can buy the most amazing cleaning agent in the world and spray every single corner of every place and everything, and the flora will still come back. It’s impossible to stop once you’ve released it, so it really becomes my specific mold. Nobody can replicate it. You can take my salami to Manhattan, peel the mold off, put it in still water, spray it around your aging cave and you would have my flora — but it would never taste like my salami because it has to do with humidity, the dryness, how long I hold it out, how the mold blooms. It’s total magic. You must have a pretty good relationship with the USDA if you’re doing all this stuff with mold and flora. What is their problem with charcuterie, unpasteurized cheese and all these color-changing molds if things like chicken and ground beef are killing people? For one, the new era of the USDA is much better than the old one. When did the new era start? I had to do a ton of channel studies showing that live, active mold is good, variations of mold is good, natural fermentation over three days is amazing. I went to colleges and took German documents and translated them into English and showed everything about it to prove to them that what I was making was safe. Once they saw that I put the effort in and had the science, not just dreaming it up in my head, they really believed it. An impressive offering of Cairo’s exceptionally safe cured, smoked and otherwise preserved meats at Olympia Provisions. Can you believe that there are people in this world who think that old, moldy hams hanging from a ceiling or pureed bird livers are gross? That’s why I work farmers’ markets. At least once a month, I’ll go out to suburbia and work a farmers’ market just to remind myself that everyone’s not like us. They’re just missing out on the most amazing thing and letting a huge enjoyment go by. That’s what I always tell people who aren’t willing to try it. Don’t read into my moldy salami, just try it. Close your eyes and just eat it. You’re going to enjoy it. The foie gras ban in California was recently overturned. What’s something that all that effort and all that money and all that activism could’ve gone to instead? I mean I get it, don’t get me wrong — it could be considered criminal. People have a very, very fine affection for animals. I’ve never killed an animal in my entire life and not felt some sort of remorse. It should always be very difficult to kill something. When you watch people stuffing geese, it is hard. They’re forcing food down there. While I understand that’s hard, I personally think they should have taken that money and supported a farmer to do it organically, without any pesticides. Or taken that money to a pig farmer in Sacramento who grows organic pigs outdoors instead of spending all that money just to put another small duck farm out of business. It’s just a waste of energy. Sacramento Valley is sinking, and we’re worried about duck liver. Charcuterie pairings: Beer or wine? I’m a wine drinker. It’s not even an argument for me. I love a beer on a big, long hike. But if I drink something, it’s wine. What’s a good all-purpose wine that you can enjoy with a charcuterie board all the way through? Lambrusco’s my first go-to. Very classic, lovely, refreshing, sweet; it’s not too acidic. Some people struggle when they get a high-acid wine with a big fatty piece of meat. It’s a little too much. At home, I drink from the Loire Valley — Cab Franc, Gamay. A Gamay from Bourdon with charcuterie and a pâté, if you can’t sit down and enjoy that, you’re missing out in life. My girlfriend is a sommelier, and I think we have 200 bottles of Gamay in the basement just because when we’re having a picnic or hunting out in Oregon, we gotta have a [bottle] and some pâté. Would you rather die set in the middle of a fine French terrine or slowly air-cured overlooking the Alps? Slowly air-cured, absolutely. Let me dry out. You can see the view, have the mist, the smells. I would like to be fermented, get all sour and stinky. And you don’t need to put me in a refrigerator — I’m good forever after that. All dry and stable. Put me in your backpack. What is your spirit salami?